Berlin's Chabad rabbi investigated for metzitzah b’peh ritual during his son's circumcision. RCE: We fully support him. 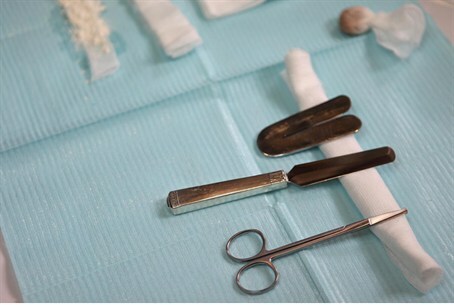 Berlin’s district attorney has launched an investigation into complaints about a circumcision in the German capital involving the metzitzah b’peh ritual. The circumcision in question took place on March 3, on the son of Berlin Chabad Rabbi Yehudah Teichtal and his wife, Leah. During the metzitzah b’peh ritual, a mohel (circumcisor) uses oral suction so that a small amount of fresh blood flows from and cleanses the wound after removal of the foreskin. This is the original way circumcision has been done since its inception. While there are rabbis today that allow this suction to be done via a tube, many do not agree to this change in religious practice. The "metzitza" procedure is mandatory for a circumcision to be halakhically valid (according to Jewish law). Berlin’s prosecutors have not said whether Rabbi Teichtal’s son was harmed by the procedure. In a statement after the circumcision, Bahls said he decided to sue after seeing a video of the procedure. He said the new German law did not legalize the practice of metzitzah b’peh, but rather required that all circumcisions be performed according to modern medical standards. The issue of circumcision has made headlines in Germany over the past few months, particularly after a court in the western city of Cologne judged the rite to be tantamount to grievous bodily harm, prompting international outrage and calls for more legal clarity. The Cologne ruling united Jewish and Muslim groups in opposition and German diplomats admitted privately that it had proved "disastrous" for Germany's international image, particularly in light of its Nazi past. Chancellor Angela Merkel's cabinet has passed a draft law to permit circumcision and clarify its legal situation. The Chancellor has clarified to Germany’s Jewish community that respecting religious rituals such as circumcision is “fundamental”. The Rabbinical Centre of Europe (RCE) has issued a statement expressing its full support for Rabbi Teichtel. “We are aware that he spoke to a Mohel (who has 30 years of experience and is one of the internationally most renowned Mohalim with a certificate from the Israeli health ministry and the Chief Rabbinate of Israel), prior to the ceremony and asked him to perform the circumcision according to proper medical manner and in accordance with the Jewish law and German laws,” said RCE. “In the past days, he has been attacked with negative comments in the media. This is truly saddening as those who attacked him did not even make the effort to speak to the Berlin Rabbi first and to find out the facts,” the statement added. “The Jews of Europe must have religious freedom. All Jewish leaders have the responsibility and obligation to stop any interference with any detail of Jewish practice. “Rabbi Teichtel has lived and worked in Berlin for almost 17 years, he is known to stand for fairness and respect and for an open, tolerant cooperation within our society,” noted RCE.